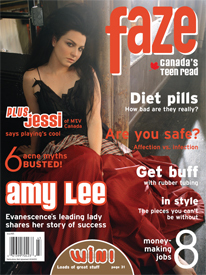 In the masculine, testosterone-fuelled universe of rock, singer-songwriter Amy Lee fits right in. She brings her goth girl self to the table and to the recording studio, no questions asked. The co-founder and lead vocalist for Evanescence lets her unrelenting strength and sheer determination push through an intoxicating downpour of adrenaline-amped guitar riffs with her soothing, classically trained piano stylings. 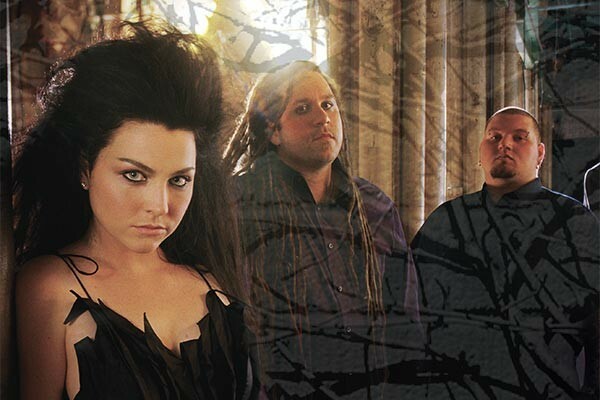 Evanescence—with Terry Balsamo and John LeCompt (both on guitar), Will Boyd (on bass), and Rocky Gray (on drums)—brings to the forefront heart-pounding musical compositions fronted by Lee’s ethereal yet reality-crashing vocals. With the debut of their sophomore album, The Open Door, set to bombard stores on October 3rd, Lee contemplates the journey that led her to this point of selfrealization. In the commonly prepackaged, pre-scripted, pre-authorized, and heavily styled world of musical “geniuses”, Lee stands out, simply because she realizes that it’s worth going on your own. Her mantra: Trust yourself. Believe in yourself. In keeping with their tradition of supreme independence, the Little Rock, Arkansas, band didn’t follow the tried and tired route to becoming a stadium pleaser. Ten years back—while others were busy tweaking their teen angst— then 14-year-old Lee and former co-founder Ben Moody paired up and focused their energies on creating a new sound. They decided to go on their own and build their band up slowly and fiercely. “The two of us would buy gear and record crappy demos and make a sound. A lot of bands would get to where they are by playing live shows. We didn’t do that.” Blazing their own trail, Evanescence slowly built their lineup and started experimenting with their sound before playing the occasional small show. Fate didn’t come knockin’, but rather it practically blew the door off its hinges in the spring of 2003 when Evanescence’s debut album, Fallen, hit the airwaves. And it hit hard. Fallen sold more than 14 million albums globally, spent over 100 weeks on Billboard Magazine’s Top 200 chart, and was certified gold or platinum in over 35 countries. 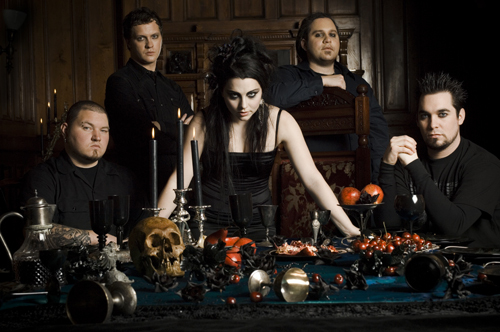 Oh, and one more little thing: in 2004, Evanescence was nominated for five Grammy Awards. They snapped up two, including the biggie, Best New Artist, gleefully beating out heavyweight 50 Cent. Now armed with their second album, set to debut this fall, and its first single, with the priceless title, “Call Me When You’re Sober,” Lee talks about her natural growth as a female artist and coming to terms with her artistic freedom. “I didn’t want to make the same album twice. Terry really pushed me to better myself and to not be afraid. Before, I was holding back for security. And now I was allowed to grow and that gave me confidence as an artist.” Under the watchful eye of longtime friend and producer Dave Frontman (Bif Naked), Lee’s unrelenting fearlessness is evident in the new album, which explodes with unconventional experiments on an epic scale, combining hard rock, gothic flair, and classical flavours, bringing a whole new sense of music to the surface. Our album! I can’t help it, it gets me excited about what I’m doing. And the new Beck song, “Girl”. It’s really cute. What’s your favourite golden oldie? I would rather watch the static on television than watch a reality show. What are the perks of the business? Getting into Nobu [the hottest sushi stop for celebs and the like] at the last minute. People who think they are so cool because they are famous. Hyde from That ’70s Show. Animal control. I was like a janitor. I would clean up cat poo. My piano and my two cats. In this industry and in life, you have to trust yourself. Do what feels right in your heart. Lee contributed to The Chronicles of Narnia soundtrack, and was even offered a cameo in the movie; she eagerly requested that she play a character who gets killed. The songs “Bring Me to Life” and “My Immortal” were both featured on the soundtrack for Daredevil. Lee is a classically trained pianist; she started playing at the age of 14. Fellow Grammy nominee 50 Cent spontaneously decided (to the shock and confusion of onlookers) to join Evanescence onstage when they accepted their award for Best New Artist during the 2004 live broadcast. Lee dreams of opening her own boutique in Seattle, featuring her own style— but each item will be one-of-a-kind, as she doesn’t like repeating herself. The band didn’t get a warm reception at first—rock station DJs initially resisted playing their music. A few tracks made their way on air before the door was finally flung wide open.